The new Meridian Water Station will open in May 2019. The station’s landmark design includes a new gold roof, a bridge deck where the ticket hall and concourse will be located, and step-free access. The new station is due to open in May this year, followed by the first 725 homes at Meridian Water. The station will act as a catalyst to bring the 10,000 new homes and thousands of jobs as part of the Meridian Water transformation project. People in Enfield are urged to back the Meridian Water Station project to win the Institution of Civil Engineers (ICE) London People’s Choice Award. Running for the last seven years, the award recognises the civil engineering projects that are transforming the lives of Londoners. Meridian Water Station is a new £46m station funded by Enfield Council and the Greater London Authority, in collaborative partnership with Network Rail. The station will be the catalyst to bring 10,000 new homes and thousands of jobs to the £6bn Meridian Water development Enfield. Its landmark design combines ‘Civic meets Civil’ engineering with stunning architecture. The ticket hall and concourse are located on a bridge deck over the West Anglia Mainline. This innovative bridge design will connect communities, providing vital 24-hour access for people to cross the railway line. Step-free access provides full accessibility from street level to three platforms. This exceptional project was delivered on time and to budget and Meridian Water Station will open in May 2019. The Meridian Water Station Project is competing against nine other projects across London which range from improving transport connections, re-imagining public spaces and enhancing flood protection and upgrading sewage treatment among others. Enfield Council Leader, Cllr Nesil Caliskan, said: “The new station is the latest landmark to be delivered at Meridian Water, symbolising the progress we have made to deliver this vitally important £6bn development. “Meridian Water will be genuinely transformational for Enfield and the station is playing a vital role in making our vision a reality. Voting will open at www.ice.org.uk/londonawards on Wednesday 03 April at 10:00, closing on Sunday 28 April at 17:00. All voters will be entered in to a prize draw to win Shaping the World book, produced by the ICE. Three voters will be selected at random to receive the book which tells the story of world changing engineering projects. The public can follow award updates on social media using #ICELondonPeopleschoice and following @ice_london on Twitter. The winning project will be revealed on Thursday 16 May at the ICE London Civil Engineering Awards in association with Jacobs. Meridian Water Station is also in the running to win Best Infrastructure Project, Innovation, Community Benefit and Sustainability & Resilience and Greatest Contribution to London Award, in association with the Mayor of London – the highest accolade of the evening. The Meridian Water Team has organised a couple of local information events where residents and local businesses can find out more about Meridian Water and its progress. The exciting £6 billion Meridian Water project will deliver 10,000 homes, thousands of jobs and a lot more and it is happening right here in Enfield. Work is nearly complete on the new station, you’ll be able to see images and models of what the project will look like and find out more about what’s in the pipeline at the events. At the first event we would also like to find out your views on our Housing Infrastructure Fund bid and the Phase Two Planning Application, if you can’t attend the event you can give us your views here. At the second we would like to get your views on health facilities for Meridian Water. The project team will be at both of the events to give you information and answer any questions you may have. No need to book in advance, just turn up on the day. Both events are drop-in sessions. If you have accessibility needs then please email us. Enfield Council is looking for partners to deliver the first of two meanwhile use opportunities at Meridian Water. Four major developers and housing associations have been shortlisted to deliver the first housing site at Enfield Council’s Meridian Water scheme. In total, 17 expressed an interest in delivering Meridian One, with 10 submitting their bids to the Council in October. Meridian One is one of the first sites being offered for procurement via the GLA’s new London Development Panel to potential developer partners, accelerating the delivery of hundreds of new affordable and private homes. The first 725 homes will be built around the new Meridian Water train station, alongside new public spaces, shops and leisure facilities. Enfield Council’s flagship development continues to gain momentum as four major housing developers and housing associations have today been shortlisted to deliver the first housing site at Meridian Water. Meridian One will see the first 725 homes built at Willoughby Lane, alongside new public squares, shops and leisure facilities. Outline planning consent is already in place for these new homes, with construction enabling works having already started in January 2017. These homes will be delivered around the brand new Meridian Water train station, which is due to open in summer 2019 and serve up to four million passengers each year at its peak. The announcement marks one of the first sites being brought forward for procurement via the Greater London Authority’s (GLA) London development Panel 2, and is the first stage of accelerating the delivery of the 10,000 new homes and thousands of jobs at Meridian Water. “This is another clear demonstration of the progress we’re making at Meridian Water and the confidence the development community has shown in the Council to deliver one of London’s most exciting regeneration projects. “It is the Council’s aspiration to create a new destination where local residents and Londoners can afford to live in a vibrant and exciting setting. Out of 17 developers and housing associations that expressed an interest in delivering Meridian One, 10 submitting their bids to Enfield Council in October, with four now shortlisted to bring the scheme forward. An announcement on the chosen development partner will likely be made in spring 2019. Progress is also being made on bringing forward a further housing site for Meridian Two at Leeside Road, which will deliver 200 affordable homes, earmarked for ‘makers and creators’ that will use new workspaces on the lower floors. This will be complemented by a new employment hub for around 900 new jobs at a 2-3 acre site along the North Circular. The Council is also progressing a detailed business case for the Housing Infrastructure Fund, which if secured in full, will see £156m of government funding connect all parts of Meridian Water to the new train station and improve the frequency of train services. Take a look at Network Rail’s latest video on the progress that is being made on the new Meridian Water Station and the wider £170m Lee Valley Rail Programme. The station is set to open in summer 2019, and will take up to four million passengers per year directly south to Straford, with onward connections to Liverpool Street, City Airport and Heathrow, and north to Stansted and Cambridge. Enfield Council’s Cabinet last night agreed in principle a series of decisions that, subject to call-in, set out a clear way forward for the flagship Meridian Water development, which will see 10,000 new homes and thousands of new jobs delivered. The decisions mark the end of the procurement process for a single ‘Master Developer’, in favour of the Council taking the lead responsibility for setting strategies, working up the masterplan and deciding the optimal phasing plan for delivery. “Today marks a watershed moment in the delivery of Meridian Water. “Meridian Water is back on track and the way we are delivering is genuinely new for a local authority. “I am pleased to say that we are also ready to accelerate delivery and will bring forward the first housing site, which will see hundreds of private and affordable homes built around the new train station. A second housing site and a site for a major employment hub will then follow. “Meanwhile, we are progressing our detailed business case for the Housing Infrastructure Fund which, if secured in full, will see £120 million of government funding to connect all parts of Meridian Water to the new train station and improve the frequency of train services. “We are also working on a dedicated employment strategy which will bring high quality jobs, life and some exciting uses to Meridian Water, very early in the development. “Meridian Water is one of the most important regeneration projects in London, with the potential to provide thousands of affordable homes and job opportunities for local people. I am pleased that the Council Leader, Cllr Nesil Caliskan, has expressed her commitment to delivering much needed new and genuinely affordable homes. “I welcome the new direction Enfield Council has set out for how these benefits will be realised, with direct control and investment by the local authority. We are working, on behalf of the Council, to secure government funding from the Housing Infrastructure Fund for Meridian Water, and with the new train station opening in May 2019, the future looks very promising." Meridian Water will prioritise the benefits for local people and reduce inequality in the Borough. Meridian Water will create a thriving new economy for the Lee Valley. Meridian Water will be a memorable place bursting with character, bringing the best out of the existing opportunities. Meridian Water will offer a choice of affordable homes for local people. Meridian Water will make the planet better and create new opportunities for growth as a result. Meridian Water will be a vibrant mixed-use environment, incorporating liveable places to be enjoyed by everyone regardless of ability, income, age and cultural background. Meridian Water will be designed to prioritise walking and cycling by choice - almost car free. Meridian Water will proactively engage and empower communities and continue to grow by responding to the changing needs of local people and society. The new Meridian Water Station will open in May 2019, unlocking the area for commuters, taking passengers south to Stratford London and London Liverpool Street and north to Stansted and Cambridge. Train connections from Meridian Water are just 17 minutes direct to Stratford London, 24 minutes to London Liverpool Street, 22 minutes to London City Airport and 43 minutes to Heathrow. Following the Cabinet decisions, three development sites are being brought forward, with the first site being offered via the GLA’s London Development Panel immediately after the summer. This will allow for a quick procurement process open to all the organisations and joint ventures who secured a place on the panel. Importantly, these sites will be offered on the basis of a Development Agreement rather than a sale of the land, allowing the Council to retain control, for example to ensure the quality of design and build, and prioritise sales of new homes to local people first. Site 1 is at Willoughby Lane, which has an outline planning consent in place for 725 homes. The site is currently being remediated by the Council and is adjacent to the new Meridian Water Station which opens in May 2019. Site 2 is the Leeside Road Gas Holder site. This site will be included in an outline planning application for the wider area, which the Council is bringing forward, linked with the Council’s bid to the Housing Infrastructure Fund, which will see workspace on the lower floors with around 200 affordable homes above. Site 3 is around 2-3 acres alongside the North Circular where Harbet Road meets Argon Road, which would be suitable for a new employment hub, creating around 900 new jobs. An increase in train services at the new station, initially to a minimum of four trains per hour but with the capacity for this to increase to six trains per hour. A new central spine road – known as The Causeway – which will link the whole of Meridian Water to the new train station. These works also include flood alleviation measures; three new bridges over Pymmes Brook and the Lee Navigation; pipe works for the Council-owned energy company energetik; new cycle and pedestrian links and junctions; and land remediation to support the early delivery of homes. Together, these measures will increase access to Meridian Water, unlock currently landlocked and inaccessible parcels of land, attract inward investment, increase land values and facilitate the levels of new homes and jobs desired by the Council at Meridian Water. Finally, the Cabinet also endorsed the principles of a major new Employment Strategy for Meridian Water, which will now be developed further. “We have seen major occupiers recently take space at the Queen Elizabeth Olympic Park, Battersea Power Station and White City and our long-term strategy includes attracting strategic occupiers to relocate to Meridian Water, where we have the potential to offer the attributes required by growth sectors in a better location than many parts of London. “The scale of the Council’s control, vacant land and existing industrial buildings offers a significant opportunity for the Council to start to deliver on our employment vision from the outset by creating the right conditions for existing and new enterprises to be established, nurtured and grown rather than waiting for the long-term development. As part of this approach, a further land acquisition was approved at 4 Anthony Way, part of which is occupied by Building Bloqs who are potential partners of the Council for the open workshop. Since April 2014, the Council has acquired 87 acres (35 hectares) of land at Meridian Water. It currently owns 64% of all developable land within the red line boundary of the site and has to date committed £157m to land acquisition. Following the announcement in November 2017 that work has begun on the new Meridian Water railway station, Network Rail caught up with Steve Vidler, Senior Programme Development Manager at Network Rail, and Enfield Council's Consultant Development Manager for Meridian Water, John Baker, to see how the new station is progressing. The new station, being delivered by Network Rail, will replace the nearby Angel Road station and will open in 2019. The station is expected to serve up to four million passengers, including the 10,000 new homes and thousands of jobs coming forward over the next 20 years as part of the Council's Meridian Water scheme. You can watch Network Rail's video below. You can also catch our interview with Geoff Marshall, Video Editor at the Londonist, on the new station below. 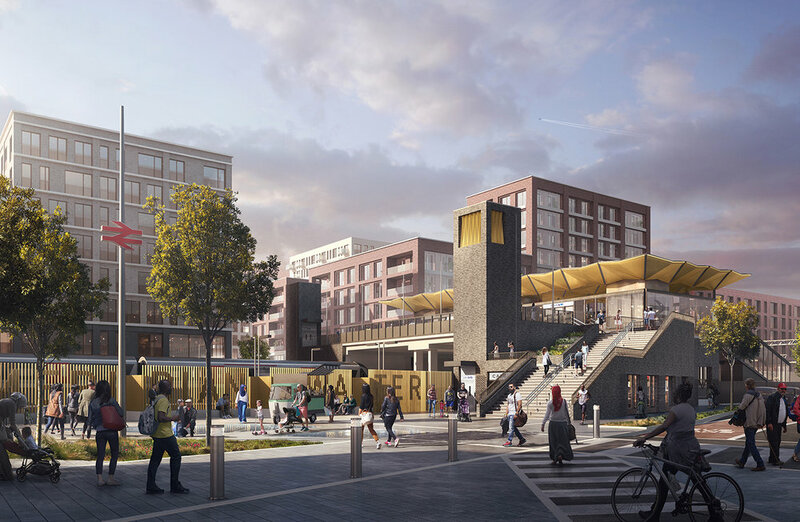 It is not very often London gets a brand new railway station, but construction work has now started on Meridian Water station, as momentum continues at Enfield’ Council’s £6bn regeneration. The new station, being delivered by Network Rail, will replace the nearby Angel Road station and is expected to serve up to 4 million passengers, including the 10,000 new homes and thousands of jobs coming forward over the next 20 years, as part of the area’s significant transformation. The modern station has been designed by a world class design team including ARUP, Atkins and architects KCA and will include three platforms and a new footbridge accessed by lifts and stairs as well as new retail space. Provision for an additional fourth platform has also been made to accommodate proposed plans for Crossrail 2. “Our Meridian Water regeneration is a once in a generation opportunity to provide thousands of new homes and new jobs for Enfield, and deliver significant benefits for the local community. It is vital that as drivers of this regeneration, Enfield Council ensure the right infrastructure is put in place to support the area’s transformation and this latest milestone is a demonstration of our hard work to deliver the best possible development for our residents. Meridian Water Station will open in 2019, unlocking the area for commuters, taking passengers directly south to Stratford London and London Liverpool Street and north to Stansted and Cambridge. Train connections from Meridian Water are just 17 minutes direct to Stratford London, 24 minutes to London Liverpool Street, 22 minutes to London City Airport and 43 minutes to Heathrow. This announcement follows the news in June that Enfield has become the majority owner of the Meridian Water site, owning 87-acres 64%) of developable area through the purchase of the 32-acre Stonehill site. Enfield Council can confirm that discussions with Barratt to enter into a Development Agreement for Meridian Water have been terminated. Barratt had been selected as preferred bidder at a Cabinet Meeting on 18 May 2016 following a procurement process, however following the subsequent negotiations, Enfield Council has informed Barratt that their proposed terms were unacceptable which has now led to discussions with them ending. “Enfield Council can confirm that, if Barratt would not confirm its commitment to a number of key elements of its own bid by today at the very latest, then a recommendation was to be presented to a Cabinet meeting on Monday 30 October that its position as preferred Development Partner for Meridian Water be terminated. Ahead of this, Barratt has taken the decision to formally withdraw. “Meridian Water remains one of the most exciting development opportunities anywhere in London but we were simply not prepared to sign up to what we considered to be a poor deal for the residents and businesses of Enfield. "Enfield Council therefore informed Barratt that their proposed terms were unacceptable which has now led to discussions with them ending. “We are immensely proud of the progress we have made at Meridian Water over the last 18 months as Enfield Council has taken direct control to ensure successful delivery. “We already own two thirds of the developable site. We have Housing Zone funding secured from the GLA. We have achieved a planning consent for the first 725 homes at Willoughby Lane and are managing the construction enabling works on-site. We have developed our ‘Meridian Works’ proposition with Europe’s largest open workshop for makers, creators and artists opening in 2018. And we have secured the delivery of a new rail station at Meridian Water which will open in 2019. The Council will continue work with partners from across the private sector and the decision will not impact the timetable for delivery of the new rail station nor the first new employment sites at Meridian Water. Ladysmith Park will soon be starting works on site, and will be ready to open its doors to local residents in Easter 2018. The pocket park, which is situated near the brand new Meridian Angel Primary School at Ladysmith Road, has been designed by local residents, community groups and schools alongside the Council. The Council has also been working with local schools, colleges and employment support services to ensure Meridian Water is offering job opportunities for local residents, with young people offered paid internships to build benches and picnic tables for the park. Local children will also be invited to participate in art workshops run by street artists to design the finished look of the park. We are delighted to announce that Karakusevic Carson Architects (KCA) have won a design award for Best ‘Meanwhile’ use for ‘Meridian Works’ at the recent New London Architecture Awards 2017 on Wednesday 5 July. The award recognises KCA’s work designing Meridian Works, a new hub for makers, creators and artists, including Europe’s largest open workshop opening in 2018. Meridian Works will be a series of places and spaces tailored specifically towards small businesses, start–ups and freelancers in a major boost to the ‘maker’ economy of London. The first phase of Meridian Works is the creation of Europe’s largest open workshop for Building Bloqs and ACAVA (Association for Cultural Advancement through Visual Art) supporting 300 jobs. KCA were also nominated for Best ‘Masterplans & Area Strategies’ for Meridian Water – which awards area–wide regeneration projects and new parts of London. The 20-year £6bn Meridian Water scheme will deliver 10,000 new homes and 6,700 new jobs to North London. Latest land deal further demonstrates Enfield Council’s pioneering approach to regeneration delivery. Enfield Council has announced another major land acquisition at Meridian Water – the 32 acre Stonehill and Hastingwood sites – taking them a step closer to full control of all developable land for this significant regeneration. The Stonehill site, in the eastern part of Meridian Water, has the potential to provide 2,200 of new homes, alongside new office and retail space and unlocking 2,000 new jobs for Enfield, all with the backdrop of the beautiful Lea Valley Park and on the doorstep of the River Lea. GLA approval has now also been given for the first Meridian Water site to come forward – Willoughby Lane. Construction work is due to start in 2018 once a detailed application is submitted by selected development partners Barratt London. The area will deliver 725 new homes alongside new public open spaces, shops and community facilities as well as its own brand new railway station, already funded and being delivered by Network Rail. By the end of Meridian Water’s 20-year delivery programme, it will have delivered 10,000 new homes, 6,700 new jobs. Cllr Doug Taylor, Leader of Enfield Council, said: “Enfield Council is continuing to take direct control of this significant regeneration at Meridian Water, buying up the land, overseeing the infrastructure investment and taking an active lead in its delivery. It has always been part of our plans to acquire the Stonehill site and the completion of this deal reaffirms our commitment to deliver a truly special new piece of London that our residents and all Londoners can benefit from. “Meridian Water will transform this part of the Borough, bringing thousands of new jobs into the area alongside new homes and beautiful public spaces, connected to a new railway station which will open in 2019. “The Council now owns around two thirds of the developable area at Meridian Water and this latest land deal, coupled with GLA approval for phase 1 marks an exciting time for this important development opportunity and I am thrilled to see it begin to take shape”. In March 2017, Enfield Council completed the purchase of the 2.1acre VOSA site – a redundant vehicle testing site south of the Stonehill site. The total Meridian Water regeneration area covers 210 acres, but this includes the rail lines, roads, waterways, green belt land and the current Tesco and Ikea stores. The total developable area is 136 acres and the Council now owns 87 acres (64%). In summer 2016, Enfield Council selected Barratt London, part of the UK’s largest housebuilder, working with SEGRO, one of the UK’s leading owners and developers of high quality workspaces, as selected private development partners. Construction work will begin on the first homes at Willoughby Lane in 2018. "In some ways it would have been nice to be able to sit back, wait for the private sector to swoop in and then just rely on our role as planning authority to influence the nature of the scheme. But that was never going to happen at Meridian Water." Peter George, Enfield Council’s Assistant Director for Regeneration and Planning, explains why the Council’s role at Meridian Water provides a model for others to follow. We saw here a site with enormous potential – next door to the amazing Lee Valley Regional Park, with water flowing through it, fantastic road connections and on the West Anglia Main Line. However the area was in multiple site ownerships, with low land values and a requirement for new infrastructure. At a time when Enfield and London are in clear need of new homes and job opportunities, it would have been easy to put this in the ‘too difficult’ box and accept defeat. But we didn’t do that. Instead we asked ourselves what it would take to make this happen and we have stayed focussed on that agenda ever since. The first thing we have done is accept that we will take risk to unlock regeneration. We are acting more like the private sector in taking decisions that too often public bodies shy away from. And we are putting money on the table, aware that investment now will generate returns later and ensure we shape the regeneration from the earliest stages. We have organised the delivery of the new rail station on the development site itself, relocated from the current Angel Road station. We have been actively involved in securing this outcome and took on the design of the station itself, working with Network Rail, to ensure it perfectly met the needs of the regeneration programme and Masterplan design. The station will open in 2019 connecting to Stratford London in 17 minutes, London City Airport in 22 minutes, London Liverpool Street in 24 minutes and Heathrow in 43 minutes. Meridian Water will be a truly unique proposition within London, but what does this mean and what are the key ingredients? We have commissioned a Meridian Water Placebook which will clearly articulate what will define Meridian Water in the years to come. We have also appointed our own design team to prepare a Masterplan for the entire site and to prepare the detailed design for Phase one, the first 725 homes around the new station. We have undertaken the site preparation works ourselves in advance of handing the site over to our development partners later in 2017. We have been assembling the site ourselves for more than two years, completing multiple site acquisitions, totalling 23 hectares and we now control almost half the developable area. This provides project certainty, enables the scheme to be delivered far faster than relying on a CPO and purchasing land early ensures that the Council is maximising returns ahead of selling land on to Barratt London on a phased basis. We are delighted to have attracted world class development partners in Barratt London, part of the UK’s largest homes builder and SEGRO, the specialist provider of high quality workspaces. But we remain in control of the overall regeneration. Specifically, the Council will be taking the lead on the strategic vision, masterplanning, speed of delivery, much of the infrastructure coordination as well as owning all of the retail and meanwhile uses. We know that Meridian Water will take time to deliver. But we have the land and the opportunity now. So we have developed something that we think will be very special in the form of ‘Meridian Works’. Meridian Works will be a series of places and spaces tailored specifically towards small businesses, start-ups and freelancers in a major boost to the ‘maker’ economy of London and helping signal the new opportunities for major occupiers at Meridian Water. The first phase is the creation of Europe’s largest open workshop for makers, creators and artists, which together with a rooftop bar and restaurant overlooking the canal will create a genuine destination, opening in early 2018. The Council has long had an ambition to provide sustainable energy and at Meridian Water we had a blank sheet of paper and potential customer base. So we have formed our own energy company, 100% owned by Enfield Council, called energetik which will supply heating and hot water to all 10,000 homes and more beyond. We were the first UK local authority to obtain a back to back loan from the European Investment Bank and London Energy Efficiency Fund and we are currently investing £58 million to set this up. energetik will help reduce carbon emissions as well make money for the Council. It has taken an enormous amount of work to finally reach the delivery stage of Meridian Water, but here we are. In the coming months we will sign the Development Agreement, we will see the station construction works underway and we will start work on Meridian Works. In two years from now we will have the station open, over 700 homes under construction and many crafts-people and businesses operating from the site. I passionately believe the approach Enfield Council is taking to be pioneering, in the finest traditions of the public sector and I equally believe it provides a model for others to follow. Our residents and ratepayers will be the main beneficiaries and we also expect to make a direct financial return on our investment. It is a true win-win and I am excited for the future. Enfield Council completes purchase of the 2.1 acre VOSA site as the Council continues its pioneering approach to deliver regeneration. New Meridian Water brand, website, images, fly-through and video unveiled (www.meridianwater.co.uk) as works continue on site. Enfield Council today confirmed the completion of their next land acquisition at Meridian Water with the purchase of the 2.1 acre VOSA site, giving the Council control of almost half the developable area. “All of this is only made possible by the direct and active involvement of Enfield Council. We are buying land now, rather than waiting for values to rise later, and I commend our team on completing yet another site purchase as we now own almost half the site. “We are also overseeing the infrastructure investment, creating a comprehensive programme of meanwhile uses through Meridian Works, delivering low carbon heating and hot water through our own municipal energy company energetik and we will be directing the retail strategy ourselves. The redundant vehicle testing site, known as VOSA, was acquired from the Secretary of State for Communities and Local Government, acting for the Driver and Vehicle Standards Agency. Previous site acquisitions include the 18 acre Willoughby Lane site, purchased in March 2015, where construction enabling are already underway and where the first 725 homes will be built alongside the new railway station. The total Meridian Water regeneration area covers 210 acres, but this includes the rail lines, roads, waterways and the current Tesco and Ikea stores. The total developable area is 118 acres and the Council now owns 55 acres (47%). Enfield Council has also selected private development partners – Barratt London, part of the UK’s largest homes builder, working with SEGRO, one of the UK’s leading owners and developers of high quality workspaces. Today (Friday 27 May) Enfield Council has announced it will be creating 16,000 jobs and 10,000 homes on its flagship £6 billion development Meridian Water. The Council has appointed Barratt London as the master developer for the project, who will work with SEGRO as a development partner on the urban logistics element. The project will provide 10,000 homes, 6,000 permanent jobs, 10,000 jobs in the construction industry, and supporting infrastructure including a railway station, shops and other community facilities in a beautiful waterfront setting. As one of the biggest developments in the United Kingdom and one of the largest housing developments in London it will also play a major role in helping to ease the housing crisis in the capital. Meridian Water has already been given housing zone status by the Government meaning it will be easier and quicker to provide new housing on the site than would be normal. But the scheme will also see significant investment in the area’s community facilities and transport links which will improve connectivity between north London and the Lee Valley corridor and help to add an estimated £3 billion to the UK economy by 2036 by stimulating growth elsewhere in the region. Enfield Council’s Cabinet Member for Housing & Housing Regeneration, Cllr Ahmet Oykener, said: “It is incredibly exciting that we have appointed Barratt London & SEGRO as their development partner to make Meridian Water a reality. “Now we can start getting boots on the ground and proceed with this transformational project for Edmonton and the wider area and create a truly world class development which will improve the quality of life for tens of thousands of people. Enfield Council’s Cabinet Member for Economic Regeneration & Business, Cllr Alan Sitkin, said: “Meridian Water will give an enormous boost to the construction industry both in London and the United Kingdom, creating thousands of specialist jobs as we create a legacy of opportunity, investment and employment in London. “Meridian Water will supply Enfield and further afield with the jobs, training and opportunities to lift some of our most deprived communities out of poverty by providing good quality employment opportunities in the very heart of their communities. “I’m delighted we have appointed Barratt London & SEGRO to deliver this exciting project given their strong track record of delivering major regeneration schemes in the UK. “The growth and prosperity Meridian Water will create will give our residents, some of whom live in the most deprived parts of London, an unparalleled opportunity to benefit from the jobs and training opportunities we will be creating. The formal appointment of Barratt London & SEGRO as their development partner, is subject to caveats around Enfield Council’s call in process and the Alcatel period that must be observed before the Council can enter into contracts with the winning developer. The construction jobs will be provided over the 20 year lifespan of the project. Enfield Council is committed to paying the London Living Wage and providing good quality jobs in the borough. Alastair Baird, Barratt London’s Regional Managing Director said: “Barratt London and our development partners SEGRO are delighted to have been selected by LB Enfield as their preferred development partners for one of the most exciting regeneration opportunities in London. “We look forward to collaborating with the Council in the coming months and years to ensure that we deliver the right mix of housing, infrastructure, jobs and public services to create a sustainable new community that will benefit existing and future residents of the area. Alan Holland, SEGRO Greater London Business Unit Director said: “Being selected as the development partners with Barratt London for the regeneration of Meridian Water is great news. “We have a long standing relationship with the borough with a number of industrial schemes already up and running, bringing real jobs to Enfield and the wider region.